Is it possible for senior adults to learn French? How can you learn French when you have memory problems? Today, I’ll share my experience teaching French to students with memory troubles, and tell you what my approach was, and the French method I used. My answer is: don’t give up on your dream of speaking French! 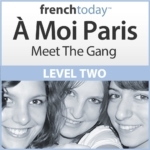 People can enjoy learning French at any age, even if their memory is not what it used to be. However, you do need to find the right method and approach to learning French efficiently and fix realistic goals for yourself. Actually, I started developing my A Moi Paris French learning method for a senior student I was teaching 20 years ago in Boston. Anna was a former Russian scientist. As a younger woman, she had been tortured in Russia and escaped, and ended up living in the US. She still had terrible nightmares and would suffer from extreme lack of sleep. When she had not slept for a few nights, her memory just didn’t work. She couldn’t remember any lesson we had covered and we had to start over with the French book I was teaching with at the time. Her French pronunciation was terrible, and even after all the repetition we did, it just didn’t stick and she would read French like she would Russian. I felt sorry for this brilliant mind: it was embarrassing having to start reviewing the conjugation of être and avoir in the present tense over and over and over again. And it was useless. As a teacher, I was pulling my hair out to find a way to teach her French. I tried different books, but nothing worked. No matter how clearly I would explain things to her, she would simply forget both the logic and the words. So I decided to write a very simple story for her, where I would use the verb avoir over and over but this time within the context of a real story. And I recorded it (on a cassette tape!!). I thought that at least, she would get the pronunciation right, and then reading the French story several times the both of us together would be more fun than reading the conjugation of avoir! The results were surprisingly encouraging. She remembered the story, and on a good day, would be able to come up with entire sentences from it. Week after week, she started to build up her French knowledge, and mostly pronunciation reflexes: she didn’t have to think, the French pronunciation of well-repeated words and sentences would come naturally to her. Now, I won’t say that she was the best French speaker. She did make a lot of mistake when she spoke. But she had fun learning, and learned enough to be able to communicate in everyday situations, interact politely, and mostly do so with a decent French accent. Anna was then able to accomplish her dream: now that she could communicate in French, she and her husband retired in the Provence region. After the success this method had with Anna, I developed it more and started using my audiobooks with all my French students, no matter their age or memory capacity, with the same great results. To this day, I am convinced that learning French in context and with audio is the best and fastest way to learn French to communicate. Now, this doesn’t mean you should skip grammar. Explanations are important, and some students really need to know the “why” before they can apply the rules. Other students on the contrary learn best by mimicking both pronunciation and grammar structure. A good French learning method should have both. And of course audio. Setting a realistic goal for yourself is probably the most important step when you want to learn French. Lots of students tell me: “I simply want to understand the French when I go to France”. Ok, but that is a very ambitious goal! Starting with “I want to be able to order in a restaurant and buy a baguette in a boulangerie” would be much more realistic. So, establish precise, realistic goals for your French studies. Then find the right learning tool to get you there and focus on mastering that, and only that. With today’s access to a lot of free sources to learn French, it’s easy to get distracted… You can watch videos or listen to French songs for fun, and it may even help with your French along the way. But you should concentrate your efforts addressing one thing at a time. Then repeat, repeat, repeat: as I always say, repetition is the key! For many students who do have memory problems, my experience is that practice works better than theory. So maybe go over the explanations once, but then concentrate on repeating practical sentences in a level-adapted dialogue. Things you could actually repeat and use in everyday situations in French. Work with audio, so you can train on understanding the French when they speak, and be understood when you answer. French verb conjugations are a pain. And there is a lot to memorize: not only the verb forms themselves, but also the right pronunciation, and of course the logic of when to use the tenses… It can be overwhelming, especially when your memory is not at its best. So, you need to make choices: prioritize what you really need to know. I say your priority to communicate in French shouldn’t be mastering the French subjunctive. So concentrate on mostly learning your French verbs in the present tense, starting with the “je” and “vous” forms (the most useful forms for conversation). Then maybe learn the imparfait and passé-composé – as far as you are sure you understand when to use them. Passé-composé, imparfait and present indicative are the most used tenses in French. Learning a language takes time. I lived 16 years in the US, consider myself fluent in English. Yesterday, we had visitors from England. I had a really hard time understanding what one of them was saying! And for some reason, I couldn’t speak either: it was just an off day for me… It’s annoying… and humbling… but it’s common with languages. Most people who are learning French as a senior do it for the pleasure of it. So, have fun along the way, and don’t be too hard on yourself. You’ll learn what you’ll learn. There will be days with, and days without. C’est la vie !